Pictured: 98 Kultarr Road, Berry Springs, NT. For sale by May Dunlop and Jamie Pollock of Northern Territory Sotheby's International Realty as seen on Luxury List. Data released by CoreLogic reveals the median house price in Darwin stands at $416,149. It's a bright spot on an otherwise dark horizon, following the news that Australia's housing market recorded the weakest conditions since the last Global Financial Crisis. Darwin's property market has been rapidly falling - since July 2017, the downturn has resulted in a 24.5 per cent drop from August 2016. Index results for December 2018 have Darwin down at -1.8 per cent and -1.2 per cent for the end of year quarter. 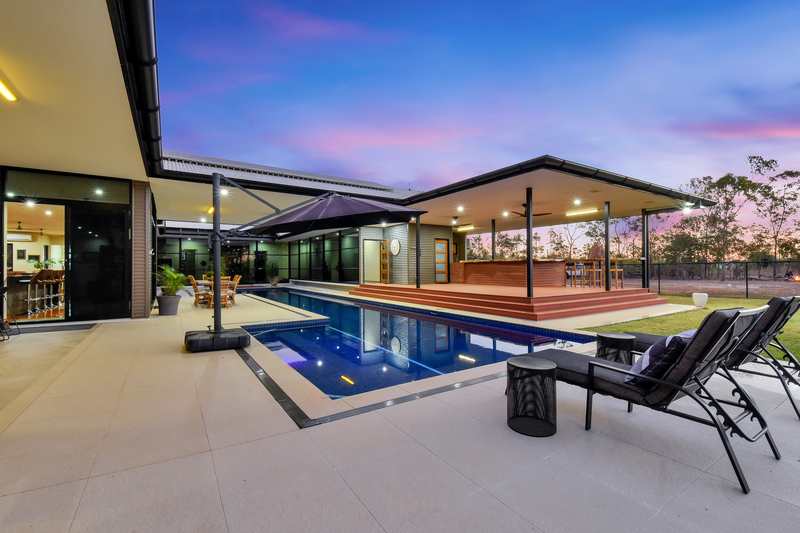 While it's not welcome news for sellers, Real Estate Institute of Northern Territory chief executive Quentin Kilian says home buyers have the opportunity to get into the market at bargain prices. He says people "have to remember housing is a commodity-driven market". With stock in surplus, home buyers stand to make a hefty return - particularly first home buyers with government incentives for new and existing homes. Mr Kilian also believes investors are likely to see "healthy capital growth" in years to come. "A soft market like this is perfect for first home buyers and investors, and when you couple that with low-interest rates and Stamp Duty concessions for first home buyers, you have the perfect buying opportunity," he told WILLIAMS MEDIA. Darwin real estate shows "strong early year form"
Private inspection numbers were up significantly over the Christmas and New Year period after December produced a massive four-fold surge in sales compared to the final month of 2017. Glenn Grantham, General Manager of Raine & Horne Darwin said they had requests for 18 homes over the period. “We rarely have private showings over the Christmas break. Most of the houses in the sights of buyers are in the popular northern suburbs of Darwin. Most of the buyers are locals, which partly explains the requests for private showings over the Christmas break," he told WILLIAMS MEDIA. While buyer enquiry to conversion rates are still subdued, many of the buyers are genuine, Mr Grantham observed. “They are not tyre-kickers and some buyers are waiting for the right property. However, in a small market such as Darwin, supply can plummet quickly and push prices up just as fast." Rental vacancies fell by 20 per cent over the past few months, which is set to impact rental yields in Darwin. CoreLogic data shows rental yields in Darwin are 5.8 per cent, the highest in Australia. Mr Grantham told WILLIAMS MEDIA he's surprised there aren't more interstate investors. “There’s no doubt our yields in Darwin are very good, and the only way is up given falling vacancy rates. I’m surprised with our healthy yields we don’t have more interstate investors coming to Darwin in droves,” Mr Grantham said.